A light and easily absorbed day cream for combination skin, formulated with over 90% Organic ingredients. A light & easily absorbed face cream for combination skin, formulated with over 90% Organic ingredients. The cream base ingredients include a blend of Olive, Flax and Sunflower oils, in addition to Shea and Cocoa butters. This is luxuriously fragranced with Neroli and Jasmine essential oils. Neroli essential oil; A highly valued oil with a scent that is both calming and uplifting. This is a rejuvenating oil, useful for treating dry or mature skin, and is reputed to help prevent wrinkles. Jasmine essential oil; Refreshing, soothing and calming. Used to treat dry or inflammed skin. Shea Butter; Contains several fatty acids which are needed to retain skin moisture and elasticity. 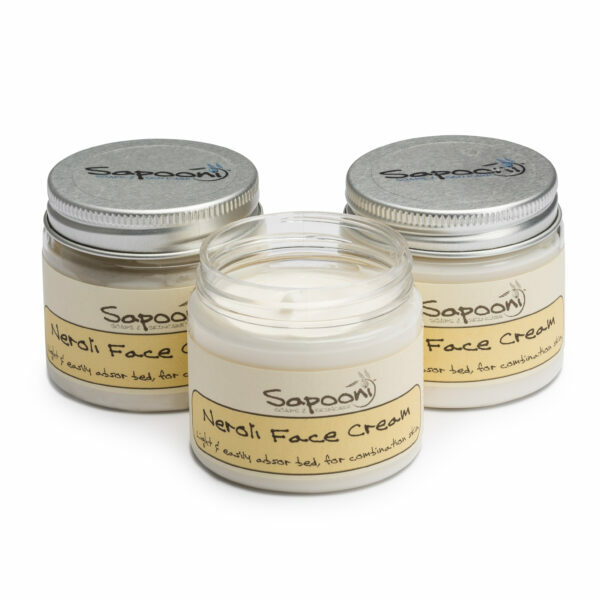 Cocoa Butter; A rich emollient, to smooth, soften and deeply moisturise the skin. Olive oil; Used as a moisturiser for millennia. Olive oil contains antioxidants like Vitamins A and E that help repair and renew damaged skin. Aqua, Helianthus annuus (Sunflower) Seed Oil*, Butyrospermum parkii (Shea) butter*, Glyceryl Stearate, Theobroma cacao (Cocoa butter) Seed Butter*, Cera Alba (beeswax)*, Glycerin*, Sodium Stearoyl Glutamate, Sucrose Stearate, Olea europaea (Olive) Fruit Oil*, Linum usitatissimum (Linseed) Seed Oil*, Aloe barbadensis Leaf Juice Powder*, Coco-Glucoside, Coconut Alcohol, Tocopherol (VitaminE), Xanthan Gum, Boswellia Carterii (Frankincense) oil, Lactic Acid, Dehydroacetic Acid, Benzyl Alcohol, Jasminum Officinalis (Jasmine) flower oil dilute in Vitis Vinifera, Citrus aurantium (Neroli) flower oil. Naturally occurring in essential oils; Benzyl alcohol, Citral, Farnesol, Geraniol, Limonene, Linalool, Eugenol, Benzyl benzoate.